Many businesses rely on Exchange Server in their daily operations to share critical data. 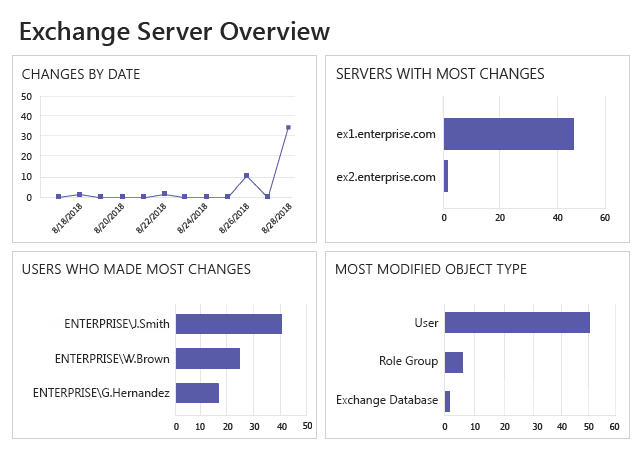 Native Microsoft Exchange monitoring tools can help you monitor Exchange activity. But can you quickly diagnose and remediate problems — for example, by pinpointing which change degraded Exchange performance or which users in your network deleted mailboxes, causing downtime for an entire department? To ensure uninterrupted availability of your email services, you need to troubleshoot incidents quickly, and to harden electronic mail security, you need to be able to easily spot threats across your MS Exchange environment. And for those tasks, you need more than native tools. Netwrix offers Exchange monitoring software that complements native Microsoft Exchange Server monitoring tools by delivering actionable dashboards and reports that give you full control over everything happening in your Exchange infrastructure in a single view. Netwrix Auditor for Exchange monitors activity and simplifies reporting, so you can stay on top of changes to server configuration, server roles of users, permissions and access events. It provides you with valuable insights, such as who changed what, when and where, with the critical before and after values. You can also see who accessed what mailbox, when and from which workstation, and what items the user viewed, edited or deleted. This timely, actionable information helps you secure your sensitive email content and ensure nothing can put the normal flow of email operations at risk. In addition to comprehensive Microsoft Exchange monitoring, Netwrix also offers solutions that enable you to stay on top of activity across your critical Active Directory and Windows Server environments.